Sponsors & Support: Digg's Logo Products - Tempe, AZ, Brian Ruisinger, C.P.A. - Scottsdale, AZ, Bill Ruisinger, C.P.A. - Kansas City, KS, KLATT Racing - Hastings, NE, Hangers Cleaners, Lincoln, NE. 2001 - Eagle Raceway IMCA Modified Rookie of the Year. 2006 - Eagle Raceway IMCA Most Improved Modified Driver. 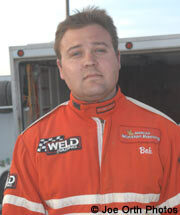 2005 - 2nd in Junction Motor Speedway Points. 2005 - Eagle Raceway Eagle Nationals Feature win. 2006 - 6th in Eagle Raceway Wingless Sprint Points. I started with Figure-8 asphalt Enduros at Riverside Speedway in Agawam, MA in the 1980's. After college, I raced the Fam Sedan class at Eagle in 1996. In 1998 I moved up to the Flyer class with a Camaro. 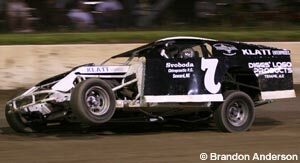 In 2000 I bought an IMCA Modified. In 2006 I raced a Wingless Sprint Car. In 2007 I ran a few 360 Winged Sprint Car races. I'm enjoying the SportMod class now. Family first... This is just a hobby (I wish others realized that! ).